Last year I was lucky to get in touch with a really nice Person from St. Petersburg in Russia via an Penpal page I frequently use. Over the time we wrote a lot to each other and also talked on Skype a couple of times and became good friends over the distance. And some months ago I had the idea why not go to St. Petersburg in one of your next vacations? It would be a good chance to meet my friend in real life and also St. Petersburg was one of the cities I always wanted to visit. So far I have never been there because I was dreading the Visa application a bit, which can be from what I have heard not always that easy. And of course there is also a language barrier for when you are travelling to a country like Russia, where it is already hard to read the signs and you cant always depend that People will be able to speak English. Or at least that was how I pictured it. 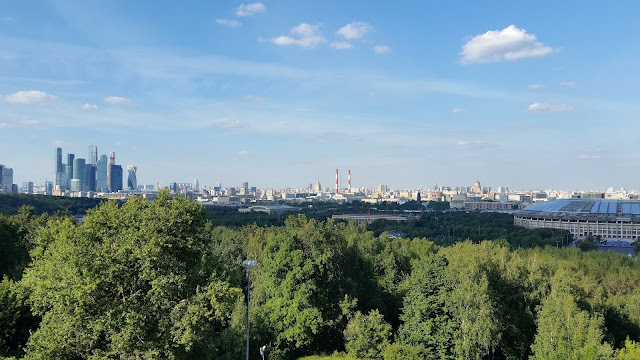 So of course having a friend there made the decision to go much easier, and especially as my friend offered me to show me around the city and would even visit Moscow together with me. So the decision was made and during the Spring I started making the arrangements. First of all, the most import thing you need is the Visa of course. I tried to gather as much information about it on the Internet as possible. And tried to get all the papers ready you need for the application. You need a proof of having an permanent income, you need a travel health insurance that specifiably needs to cover Russia, you need a Passport Picture for the Visa and most important of all, to get an visa you need an official invitation from a Russian Person or an official Russian Travel agency. As this part can be a bit tricky I tried to choose an easier way and instead of applying for the visa myself at the embassy I choose the services of an local Travel agency which is specialising getting the Visa for you. They have the contacts to the Russian Travel agencies and get it done for you in a much quicker time it would be possible for you. So on one sunny Morning I went to that travel agency with an smile on my face, that I always have when I am about to book a new vacation. Little did I know that I was now entering the most unfriendly Travel agency that must exist on this planet. I think the look the Woman behind the desk gave me when I entered should have been a warning enough. She looked at me as if she wanted to ask me how I could dare to enter her shop during the business hours. And I was even more barefaced and dared to ask for her help. After a friendly greeting from my side to which I not even got an reply I wanted to tell her that I was planning to go to St. Petersburg this summer and..... That is how far I got when she interrupted me and asked me in a really harsh tone when I wanted to go. Which I told her, she now checked her system and told me that there would be no flights then. And I think she hoped that with this, the topic would be closed and I would be leaving. But I was a really nag that day and told her with a smile that I would also be open for other possible dates. And guess by now I had managed to ruin the quiet morning she was hoping she would be having as she now needed to check the system again which she did with as much pleasure as you might have while sitting in a dentist chair. And surprise, surprise, she even found a suiting flight for me. But not enough I even wanted more and asked her about the Visa Application. I was told that the colleague is not in today but in a moment of weakness she offered to get my details and collect the documents I already brought with me, so that her Colleague could work on it when he was back. So I left everything with her and left the office so that she was able to look grimly at the office walls again or whatever she is doing when no one is in the office. A few days later I got a call on my mobile. it was the colleague from the Travel agency which informed me that he got all my papers but that my Travel Health insurance was not valid... Which was nonsense as it was, but he was persisting that he need an updated confirmation from the Insurance company. Which I thankfully got very easily and forwarded it to him as soon as possible. And now everything seemed to be okay and the travel agency forwarded my application to the Russian Embassy and now I just needed to wait. During that time I made the mistake of reading about the visa application and rules on the Internet. And the problem is that you find so many contradicting information about it on the Internet that it is hard to say which is now true and what not. On one page I found the information that you cant apply for a visa before three months of your planned trip. 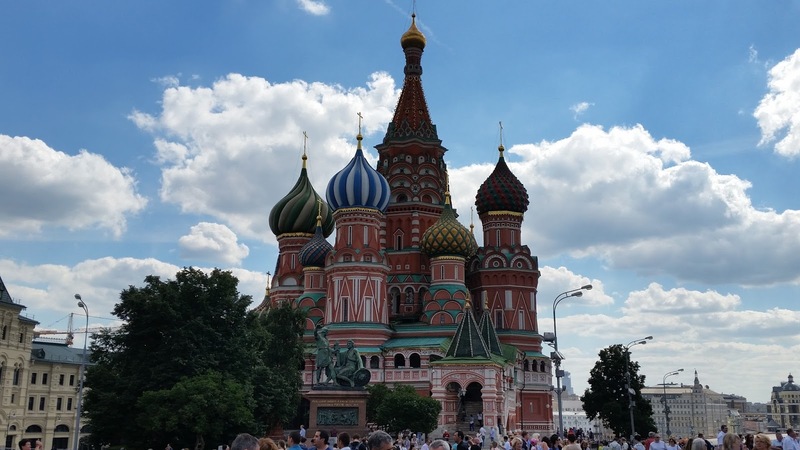 As I was still further away then three months until my planned time of arrival in Russia I decided to ask my friendly and helpful travel agency. This time I spoke to another lady which was as nearly as charming as the first one I have talked to. She listened to my question and replied with an not very well hidden air of annoyance that there is no need to worry, the application will be fine. A bit more relaxed I thanked her and hung up. Some days later I read on another page that actually the Visa is only valid for 90 days after the date of issue. It really was starting to get confusing. So when finally my passport with the visa was back at the Travel agency and I went there to pick it up, I decided to ask this question there. I had to deal with that very charming lady I had talked to on the phone before. This time she not even tried to hide her annoyance and literally yelled at me that she had already told me on the phone that there is no problem with my visa. There would only be a problem if I would try to smuggle weapons or drugs into Russia. I thanked her for her friendly and patient explanation and left with my visa. Still not very reassured that it will be okay. So finally after some months of waiting, the big day arrived and I was really going to Russia. When I told my friends that I would be going there this summer, some of them looked at me strangely and couldn't really understand why I would be going there. The reputation Russia got here is not overall positive. You often hear that it is dangerous, that you cant really walk along the streets without the risk of getting robbed. with the registration you have to do in every place you are staying you are kind of observed all the time, and whatever else I had to hear before my travelling. I have to be honest and say that I was not sure what exactly would await me in Russia. I am sure it wouldn't be as gloomy as predicted by my friends. And I was very eager to go there and to find out for myself. So very early that morning I made my way to the Airport where I had to take the first flight to Paris that morning. As there were no available direct connections on that day I had to make this small detour. The first thing I read this morning was a mail on my mobile which was saying that my flight to Paris got postponed to a later time, which would mean I would have some less time in Paris to change planes. But as Paris Charles de Gaulle is one of the more chaotic airports you never know if it will work out. In the end it did and a few hours later I found myself already on the way towards St. Petersburg. And what an incredible feeling it was. I would be really visiting this fascinating city and I really would meet my friend in a few hours. So I was really looking forward to it. The first impressions I got from Russia were from the air. It looked huge. Vast stripes of land with nothing but forests and fields in it. Very impressing. When you are living in a smaller country like Germany, where every possible square Kilometre is build up with something, this is always a nice view. And finally the city itself came into view. I was not able to make out any specific landmarks. But it looked huge and very impressing. A lot of huge buildings beside each other. At least that was how it looked from the distance. And it was also uncommon to see a huge Power Plant (Nuclear?) so close to the city and the Airport. So already in the first moments I got a lot of new and interesting impressions. Some moments later we were back on the ground and I was finally in Russia. One of the first things you notice is the different writings on the signs everywhere. It takes some moments before you get used to the Cyrillic Letters when you are not used to it. But still funny that you can make out some words anyway. After we finally got out of the plane the moment I was dreading in the last few months was finally here. I had to get through the Passport control and had to find out if my Visa was valid or not. So I stood in the queue at one of the Control booths and were waiting for my turn. I had four people in front of me. From these four persons, three persons weren't let through directly as something seemed to be wrong and were taking away by an officer to an Back office I guess. I was pretty sure that the same would now be happening to me as well. I was joking to my Russian friend Anastasia before I arrived that she might have to visit me in the Airport Prison or that I might send her an Postcard from Siberia. A joke that now seemed not to be that funny anymore. Some moments later the Man in front of me was through with his control and was allowed to enter the country and now it was my turn. I went into the booth and to my surprise everything went without any problems. I was looked at very doubtfully for a moment but then got my registration card and the stamp into the Passport and was allowed to go. And so I finally arrived. To my surprise even my luggage made it to St. Petersburg, and so I was ready to go and meet my friend Anastasia. It is always a strange feeling when you meet someone with whom you so far only corresponded over the distance via the Internet. Of course we have talked over Skype which gives you a more personal feeling then only writing mails, but it is still something different when you then manage to meet in real life. So I was really curious how it was going to be. And a few moments later we really met when I came into the arrival area of the Airport where everyone was waiting for the passengers who like me have just arrived here. As this area was totally crowded with dozens of people who held up signs with names of people they were there to pick up. So I was not really able to spot her in the crowd. But luckily she saw me and came towards me to greet me. And it was a really nice feeling to have someone to greet you when you arrive in a foreign place. It makes you automatically feel more at ease and even at home. So after we greeted each other and I guess both needed a moment to realize that we finally met we made our way towards the city. As I had my big Backpack with me we decided to take a cab into town as it would be easier as trying to squeeze into the Bus and later Metro with that big Backpack. On the way into town I had the chance to get a first glimpse of the city while taking to my friend. The first thing you see on the way into town are some industrial areas with more or less run down buildings. But it is of course understandable when you think how many financial crisis this country has been through. And also in the city centre you will find a lot of old buildings that are looking very neglected. But you also find a lot of very modern looking buildings which is showing that things are slowly changing, and hopefully for the better. Beside the train stations for the trains towards Moscow there is a very huge Shopping Mall that is as modern as anything you will find in the rest of Europe or the USA. So the newer buildings are very up to the modern global standard. But on that first moments on the way towards the city centre the old and neglected buildings were more in view then the newer ones. But it changed the more we got into the city centre. What you could also tell in these first moment that St. Petersburg is not only a huge city but also a very lively one. A lot of people were on the street. And everyone seemed to be active in some way. On their way to work, walking their dogs, doing some jogging or it was tourists like me who were out exploring the city. So it felt like a very pulsating city in that first moment. And that was an impression that didn't changed in the upcoming days. Then we finally made it and arrived at my Hotel that was located in one bigger street not too far away from the Railway Station for Trains towards Moscow and the Nevsky Prospekt, the Main street of the City And this is where we headed after a short stop at the Hotel and the Bank to exchange some money. And then we were on our way to that Main Avenue of the city. It is incredible sight. In total this street is about 4,5 Kilometres long and offers you a wild mix of everything you could ask for. You find Restaurants, Fast Food Shops, Bars, Souvenir Shops but also more expensive and exclusive shops alongside some very impressing Churches. open Squares and Mansions that reminds you of the long and moving history of that city. Here and the street is interrupted by some wonderful looking canals that are running along the city. Peter the Great, who build up this city spent some years living in Amsterdam and was very impressed by this city and its beauty that he decided to build up his town after this Role Model. Beside these nice canals you often find some inviting looking alleys that are luring you deeper into the historical part of the city. This was the first part of the city my friend decided to show me. And I really liked it. Walking along the Nevsky Prospekt was really interesting and fascinating. So many people walking alongside this huge Avenue. You heard so many different languages when people passed you by and here and there some street artists were showing their tricks or some bands were playing. I really liked the Atmosphere. It felt so vibrant. The same as my first impression of the city. Here and there we left the Nevsky Prospekt and looked into some of the smaller places but always came back to it sooner or later. So it really is the centre point of the city. But one of the first Highlights we visited came when we were strolling down one of those alleys alongside a canal.. It was the amazing and beautiful Church of the Saviour on Blood. A wonderful and unbelievable impressing building that you already see from far away and the closer you get and the more details you can recognize, the more amazing it becomes. 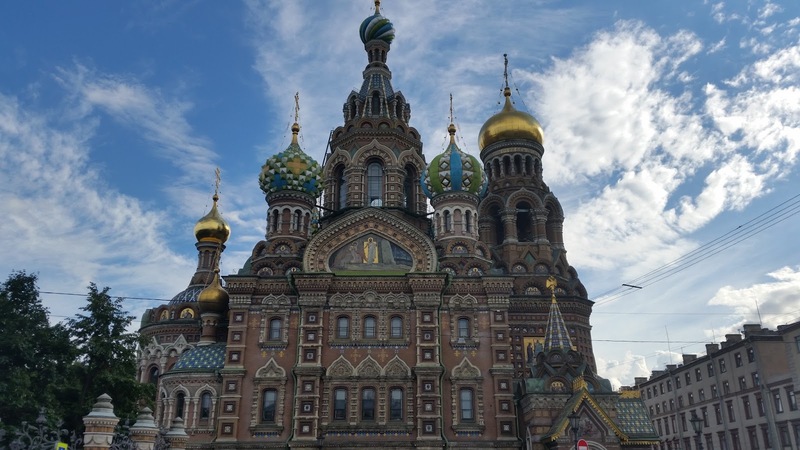 It is an Orthodox Church which most recognizable feature are the colourful onion domes which are shining in several colours and are a more then impressing view to behold. These onion domes you can find on so many churches here in Russia are always look a bit as if they could be the topping of an Gingerbread House in a Fairy Tale, but I think there are few churches where they are so beautiful made as here. But not only these domes, the whole structure looks very impressing on the outside. The whole façade was built with so many details in it. It is just incredible. There are some Mosaics here and there, the Windows are shaped into very artful arches, gold is blinking here and there. A fantastic view for sure. Unfortunately I didn't managed to see it from the inside. As always I have passed it, the queue to get in was very, very long. But no wonder. I am sure it must be even more marvellous on the inside. After that very great first impression it was time to grab something to eat. And as I was now in Russia, it was time to try the Russian cuisine. So we looked for a decent looking Restaurant that was offering good Russian food and found one nearby. And thanks to my friend, I was able to try some really good and interesting food and drinks from the Russian cuisine. First we ordered some drinks and my friend persisted I should try Kvass. A drink made out of bread or in some cases out of berries. The drink if getting fermented and is containing a very little bit of alcohol as well. The colour of it reminded me of Cola or Malt Beer, but the taste is quite different. A bit more bitter, but I have to say I really liked it. And from what I could tell it seems to be really popular in Russia as it is getting sold at every corner. The next thing I ordered and tried was the Soljanka. The famous meat soup of Russia. A soup with several types of sausages and meat in it. Very, very good. The next thing we got were some Pelmenis. Some dumplings filled with meat that got served with Sour cream. Something I already knew from home. But they were really, really good. We also got some Pancakes filled with Cottage cheese and some Pancakes filled with apples. Everything was very, very good. I really enjoyed my first meal here in Russia. But I had the feeling I had to be careful not to gain any weight if we would eat like this every day. So it was a good thing that after that late lunch we went out again and walked around a bit more. The next place we visited was the Palace Square with the amazing Alexander Column in the middle of it. Which is as I learned is claimed to be the highest Column in the world with its 47,5 Metres. May it be the highest or not, it looks very, very impressing with it big statue on top of it.. Especially in the middle of this vast Square where it seems to dominate the whole place. 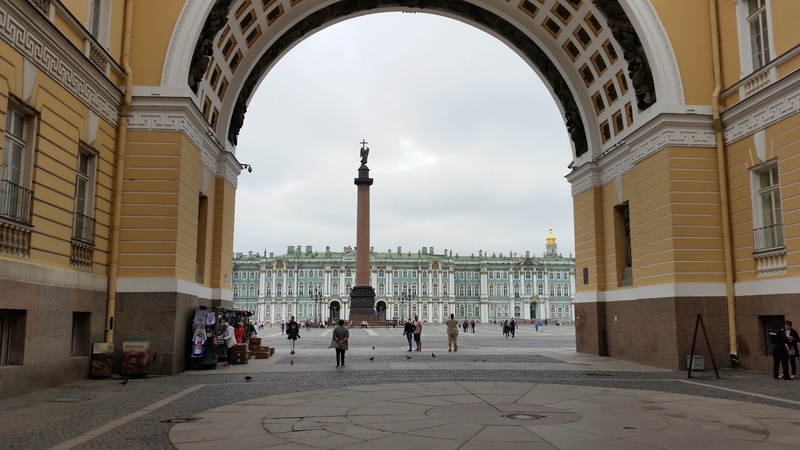 The Square is build in a long arch and is encircled by some very impressive buildings. 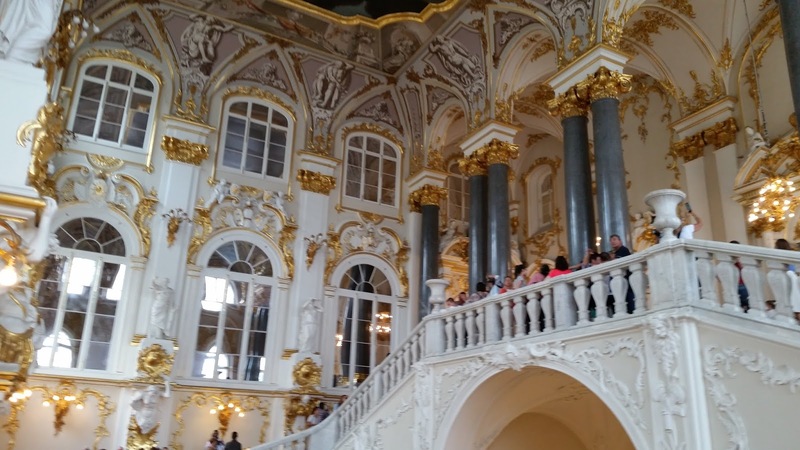 From which of course the Winter Palace is the most impressive. 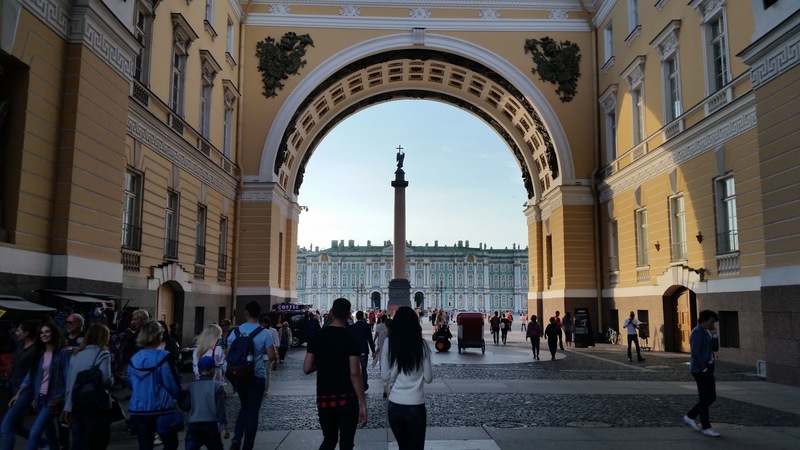 It is not only a very impressive building that is taking in the long side of the Square, it also houses the very impressive Hermitage Museum. One of the most amazing Museums you will find in this world. But later more about it. Now I was just trying to absorb the amazing atmosphere of this square. A very open and wide space that just looks inviting. And I think I could have spend hours there on that first day and just watching all the people passing by and looking as amazed as I have must look as well. But we still had some things we wanted to do that day and so we went on and walked down towards the Neva, the river that is running through the city. A very impressive and on some places very wide river. 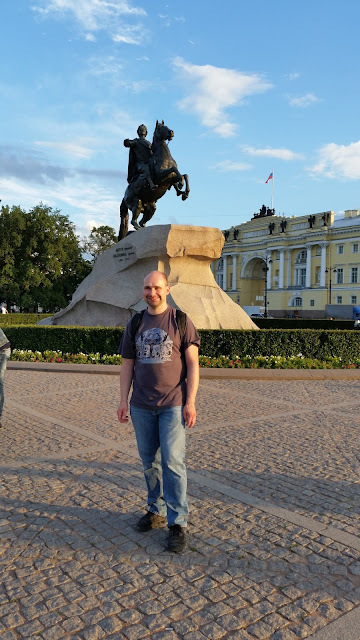 Now we were following it down only a few Metres to the Senate Square where you can find the Bronze Horseman, a very beautiful statue of Peter the Great which was named after the famous Poem of Aleksander Pushkin. A very beautiful Statue that is now one of the symbols of the city. Even more impressive is the stone on which the statue is standing. It is the so called Thunder stone which is the largest Monolith that ever got moved. The original stone weighted about 1.500 tons and was moved for 6 KM and was cut into today's form during the transport. Very, very impressive. As so many things in this city. But there is also another very impressing landmark behind this Square, and this is where we were heading now. 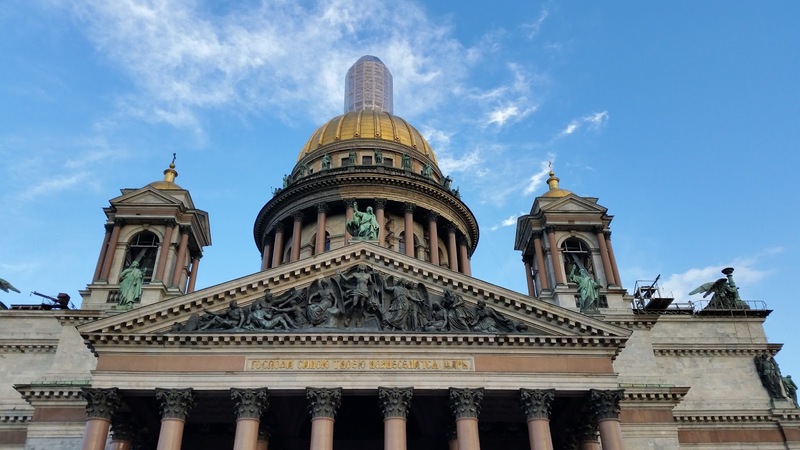 The Saint Isaac Cathedral which high up golden dome can be seen from very far away. It rises 101,5 Metres high and if you go by the volume under the Copula is the fourth largest Cathedral in the world. A more then impressing Building. It is not as richly decorated on the outside as the church we have visited before, but it already gets you with his size alone. A wonderful sight. The interior of the church was closed, but the stairs to the top of the dome were open. So we bought a ticket and climbed up the about 260 steps to the top which was a really good exercise after the meal we had. A bit exhausted we arrived at the top and found out that the view we had now was worth every step we had to climb up. 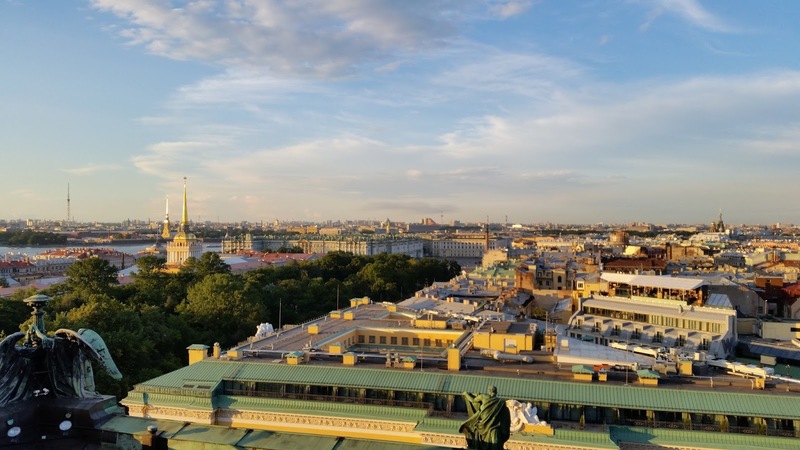 We had an 360 degree view on the whole of St. Petersburg. And that on a very sunny and bright early evening. It was magical. And in every direction you could discover something interesting and beautiful. Some of the other churches, some palaces. The Harbour in the distance, the Parks in the surroundings, the River, the Fortress on the other side of the River. Just wonderful. Something you shouldn't miss when you are there. We stayed up there for a while and took picture after picture. If I remember correctly it was the first time for my friend up here as well and she looked as amazed as I did. A wonderful idea of her to come up here. Back on the street level after we had climbed down all the stairs again and the world stopped spinning around as after walking down in circles, we took some more pictures from the ground. Before we walked around the city a bit more. The last thing we visited that evening was the beautiful Mars Field, a wide open field, that was build as an memorial for the soldiers who died during the terrible wars in the last century. In the centre you find a massive open fire that is burning in remembrance of all the fallen soldiers. Very moving. Back in the Hotel I had a lot of impressions to sort through on this first very impressive day. It was a very long day as I already got up at three in the morning. I felt very tired but also very happy to be in this exciting city. And I was really looking forward to the next day. And with that thought I went to bed and almost immediately fell asleep as I was so exhausted. On the second day after a really good night sleep I got up on time to get an early breakfast. At least I thought so, but when I entered the Breakfast Room I had to find out, that almost the whole Hotel had the same idea and every table in the Breakfast room was taken. So I had to wait a bit longer until I managed to get a free table and was able to start my breakfast. And after a really good Breakfast I was able to get out into the street with some new strength and eager to explore more. Me and my friend decided to meet up at Noon in the City centre, which would give me some time to walk around the city on my own. As the weather was really beautiful that morning I decided to go for a walk. I had a look on my map and saw that there were some interesting sights in walking distance from my Hotel. The first one was just a few blocks up my road. The very beautiful Smolny Cathedral. The Cathedral is actually part of a convent which is located right next to the Cathedral. And again this Orthodox Church is a small masterpiece. Unfortunately when I was there it was getting restored. So I could only guess how wonderful it might look in total. 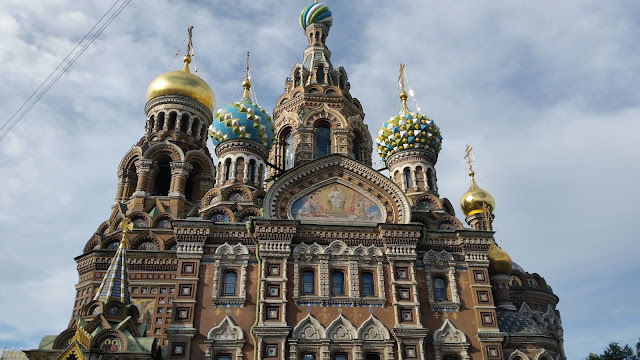 The Cathedral was built by the Italian Architect Francesco Bartolomeo Rastrelli who also built up the Winter Palace in St. Petersburg and also the Grand Palace at Peterhof. And as these two buildings also this church is a Masterpiece. And you can even find some resemblances I think. The Façades of these church are decorated very richly and pompous in a wonderful bright blue colour. A wonderful sight I think. Unfortunately only some parts of the walls were shown at the moment. But it was enough to imagine how grand it must look in total. A few steps beside is the famous Smolny Institute, that played a small role in the Russian History as it was chosen as Headquarters by Lenin for his Bolsheviks in 1917. From there on I continued my Morning hike and walked towards the Tauride Palace and the surrounding Gardens. Once this very beautiful Palace belonged to General Potemkin, a great Russian General and long time lover of Catherine the Great. Nowadays the Palace serves as an Gathering place for the Commonwealth of independent States and is unfortunately not open to the Public. But at least the Gardens are. In the middle of the Park lies a huge lake which is surrounded by beautiful meadows and seems to be a very popular space for a Morning stroll as the Park was already really crowded. From the lake you get some really nice glimpses on the Palace that still makes a very noble impression. Even though the interior has been changed a lot since Potemkin's days. After a short break in this beautiful park I continued my Morning stroll as I still needed to be at the place where I wanted to meet my friend later on. And if there was something I already found out about this city, then it was, that the distances are huge here. It is very impressing how huge this city is. The interesting places and sights are scattered all over town and you really need some time if you want to see all of them. No matter if you walk or take the Metro. As I decided to walk, as there is no better way to learn about a city I continued my way and the next small stop I made was at the Transfiguration Cathedral. A smaller but grand looking church at a busy crossroad in the middle of a busy street. Unfortunately also this Church was undergoing an restoration and almost the whole of it was covered. So again I could only guess how it might look. 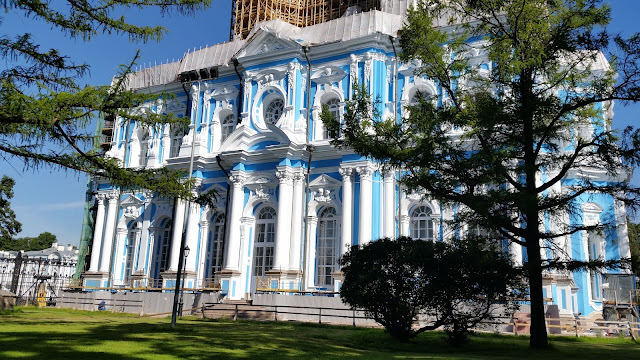 From the church it was just a short walk to the nice Mikhailovsky Garden which belonging to the Palace with the same name that is hosting part of the Russian Museum. On another side is the church of the saviour on blood that I already visited the day before. The Park itself is a really nice and quiet place to relax a bit from the huge amount of walking you have to do in this city. But as my day was only about to really start I made my way towards the Metro Station Nevsky Prospekt where I was meeting up with Anastasia. From there we took the Metro for a change and travelled to the other side of the Neva as todays Highlights were all located on this side of the river. 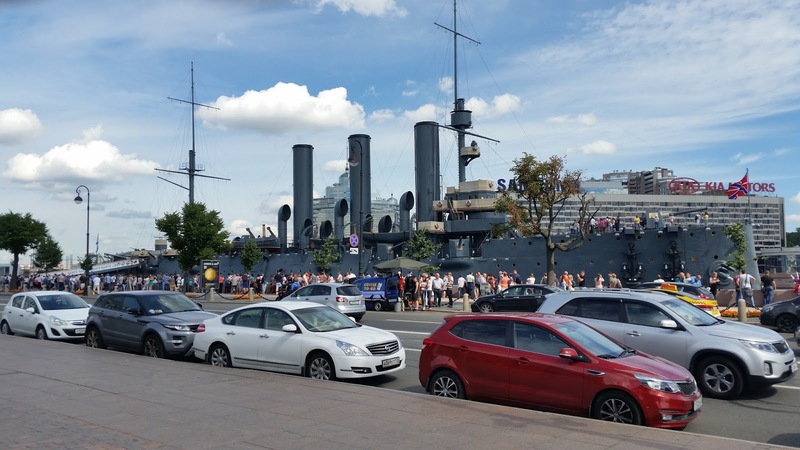 The first stop was at the famous Warship Aurora that was used during the Russian-Japanese War and the First World War. But it more famous for its role in the October Revolt in 1917 where the staff of the Ship took sides with Lenin's Bolsheviks. The War Ship is still a very impressing sight with its three huge chimneys and its massive cannons on board. And from the queue in front of it, you could tell that it is still a very popular sight for tourists. As we didn't wanted to stand in the queue and wait till we would be able to get in we decided to walk on to the next interesting place. This was the very massive and impressive Peter and Paul Fortress. It was built during the 18th century as an defensive walls against possible attacks from the Scandinavian Neighbours. But it was actually never needed for this matter. Built in the shape of an irregular hexagon and still makes a very massive impression on the visitor today. Surrounded by massive walls on all sides that really look impregnable, the inside include several buildings of interest for the visitor. Of course there is the really beautiful Peter and Paul Cathedral, that for a long time was the highest building im the city as it was requested by Peter the Great. A majority of the Russian Monarchy is also buried in this Church, including Peter the Great and Catherine the Great. There is also an old Prison Building on the site of the fortress. That at different times housed famous persons as Maxim Gorky, Dostoevsky and Alexei the Son of Peter the Great. And you can also find several more or less interesting Museums on these grounds. Including one about Medieval torture Instruments. There is also a quite controversial Statue of Peter the Great in the Fortress that is showing him in original size, but with a very small head and big feet and hands which caused a lot of discussion when it was built. Nowadays it is kind of an Lucky charm for the People in St. Petersburg. One highlight in the Fortress is of course to climb up the Fortress walls and have a look on the city all around the Fortress and trying to imagine how it must have looked 300 years ago when it was still in construction. The entrance to the Fortress is free, but you have to pay extra for every building and Museum you want to visit. But maybe that is a fair deal that so everyone can decide what he really wants to see. After we left the Fortress we decided to walk a bit alongside the water as it was such a wonderful and sunny day, and it was just nice to walk around and enjoy the view on this amazing city all around you. It is surely one of the cities you must have visit in your life I think. And there are so many interesting things to see everywhere. On our way we passed an Ship that was named after and also looked a bit like the Ship from the Flying Dutchmen and housed a Restaurant on its board, which is today nothing unusual. But beside this Restaurant there was also a Gym on board. So right after Dinner you can walk down into the Gym and try to get rid of the Calories you have just eaten. Our next stop was the oldest Museum in St. Petersburg, the Kunstkamera. 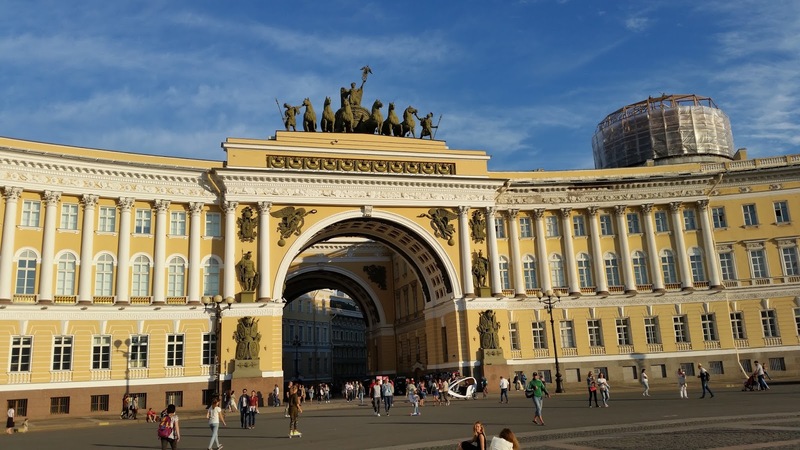 A very interesting anthropological and ethnological Museum which collection is based on the private collection from Peter the Great who opened his collection to the Public in 1719. It not only covers collectibles from all around the world that back in the time must have look more then astonishing to the People, as news from other civilisations were still rare then, but it also includes a very vast collection of in Formaldehyde conserved body parts of disfigured humans. Which at times was too hard to look at. Of course from a scientific angle it is very interesting, but some of the things there I rather had not seen. But in total the Museum is a very, very interesting place to visit and is worth the time you have to wait in the queue to get in. Funny to read that back in the days of Peter the Great, the entrance was free as he wanted to encourage his people to show interest in Science. And it was not only free, but every woman who visited the Museum got an Cup of tea for free, and the Man got an glass of Vodka. But unfortunately that seems not to be effective today anymore. As in the meantime it started to rain outside we decided to use this for an excuse to get an early Dinner now and started looking for a nice place to Dine. My friend remembered a place which she wanted to show me and so we went into a place that was called Soviet Cafe. And that with a good reason as the whole interior reminded you of the time between the 1960 - 1980's years. You had Posters and decorations from this time and also old Radio and TV devices. It was a bit like Time travelling. And also the Menu fitted the theme. As you mostly got dishes that where very popular and common during this age. I had a Kiev Cutlet, which is a fried Chicken escalope that gets rolled up and is filled with butter. So good if you dont think about the Calories. After this really Russian Style dinner we called it a night as we had to get up very, very early the next morning as we would go to Moscow then for a day. Something I was also really looking forward to. For a day during my vacation I had to get up at a very, very early hour. But of course it was for a very good reason. We wanted to spend a whole day in Moscow, and as it would take as about 4 hours with the High-Speed Train Sapsan it would take about 4 hours to get there. So of course the advantage of taking an early train would be to have more time available in Moscow. So we met up very early at 06:30 at the train station as our train was scheduled to leave at 07:10. In Russia you always have to be at the train station a bit earlier as you have to show your passport and ticket before you can board the train. So we had enough time to get on board and to look for our places. The train that reminded me a lot of the ICE Trains we are having in Germany are looking very modern both on the outside and inside. The seats were very comfortable and there was enough space for our legs as well. And right on time the train left the station and we were on our way towards the Russian Capital. The journey itself was really nice and went over very fast. The train was travelling with speeds up to 250 Km/h and it was nice to watch the landscapes passing by. Around 11 am we arrived in Moscow then and I could hardly believe it. I never thought that I would be in Moscow one day. But well here I was. And as we had to time to loose we took the Metro towards the Red Square right away, and just a few moments later, we were standing outside of the Kremlin and right next to the Red Square. But before we went there we made a short break on the Plaza we were standing on right now, there was a small market with different booths were you could buy food and drinks. We decided us for the healthy option and ordered some grilled vegetables that were really good. Now after this short break we had enough energy again to go on towards the Red Square. We just followed the other thousands and thousands of Tourists and passed beneath the wonderful and beautiful Iberian Gate and some moments later we stood right on the famous Red Square. And what an amazing sight it is. I have seen it several times on pictures, in movies and on TV. I have read a lot of books that had scenes that took place on this Square. So I knew what to expect. But still it looked a bit different. It looked much larger, much more colourful and lively. What I didnt knew was that a big Shopping Centre/Mall was covering one side of the Square as you usually only see the view into the other direction towards the Kremlin. Which was of course another very dominating Landmark here. 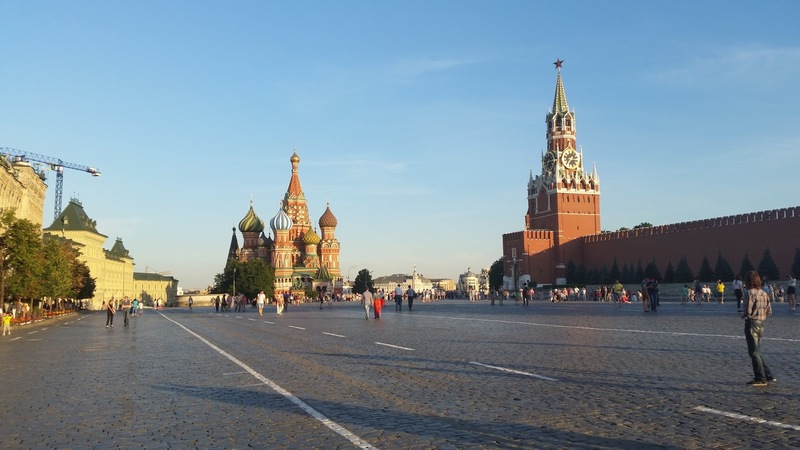 With his very thick and high Red walls and the famous Spasskaya Tower with his huge Clock. A very impressing Fortress the Kremlin. A shame that we didnt had the chance to get inside of it. I would have loved to see more of it. Right beside the walls of the Kremlin is the Mausoleum of Lenin, which was closed that day, I guess otherwise we would have seen a very long queue in front of it. On the far end of the Square we could see the amazing Saint Basil's cathedral which wonderful onion towers are known all around the world. I think this must be one of the most beautiful churches in the world. I was really astounded by its beauty. What a wonderful view. Originally built by Ivan the Terrible during 1555 - 1561 it looks more like a building out of a fairy tale or a dream, as the towers with all its ornaments and different colours seem to be from out of this world. An sight you can look at for hours without getting tired. And I think I might have ended up standing there for hours if my friend didn't gave me a friendly nudge that we should keep going as we still had some other Highlights on our tour. 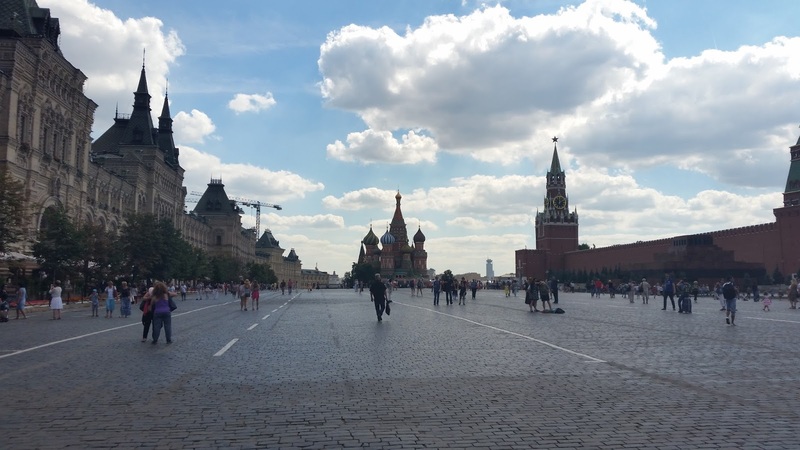 But still the Red Square was one of my favourite places in Russia. It got an really nice friendly atmosphere and you could see that almost everyone was as amazed as I was. Everyone was looking around in total awe. 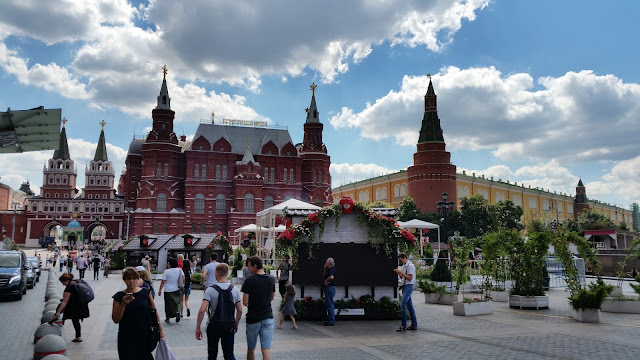 And I even learned something new while I was listening to a nearby standing Tour Guide who explained the Origin of the name Red Square. As naturally you would think that it got its name from the colour red that is dominating in every building and wall on this Square. But this is wrong. Red in Russian also got the meaning Beautiful. So Red Square means actually Beautiful Square. A name that really fits this place. Our next stop was another very impressing Church, the Church of Christ the Saviour. To get there we had to walk alongside the Kremlin walls on the other end of the Square and then somewhere cross the big road to get to the church. We just had the problem that there was no place where we could cross the Road, no traffic lights, no tunnel or bridge. Nothing. So we almost went around the whole Kremlin before we found a tunnel where we were able to cross the street and get closer to the Church. This church is a very vast building that looks very intimidating with his height when you are standing in front of it. The original church got destroyed in 1931 during Stalin's rule and was built up after the original plans from 1995 - 2000. When you are on the inside you wouldn't be able to tell that everything was quite new. On the inside you find a very impressing interior made up out of Mosaics, Sculptures, painting and a lot of golden Ornaments. An amazing sight. And for me it was interesting to see how different an Orthodox church looks on the inside from our Catholic and Protestant Churches here in Germany. A totally different style and culture. I was more then impressed here. As the church was buzzing with faithful that were praying or lightning a candle I was trying to keep an respectful distance and watched everything from afar. I think the Faith got a lot bigger significance then in Germany where most churches are empty most of the time. After that church visit it was time to spend some time outside. 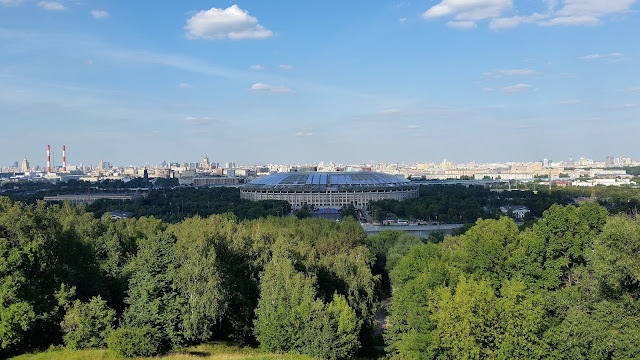 So we made our way towards the famous Gorky Park that I first heard of in the famous Scorpions Song "Wind of Change". And now we really were following the Moskva down to the Park. And what a nice park it is. A lot of meadows, a lot of trees, a lot of happy people that are enjoying the wonderful sunny Summer day we had on that day. It felt just wonderful. Everyone around us seemed to be happy and I was glad to be a part of it in that moment. And the Park was also a really nice spot for a short break from the long walking we already did that day. And it was nice to enjoy the sunshine for a moment. A bit later we continued on our way along the Moskva to get to the other side of the river again and to walk to the next Metro Station. We crossed the river via a bridge that was topped with a glass roof. I am sure in the winter this is a great protection from the harsh climate. But now in Summer it felt like as if we were walking in a Greenhouse. I was glad when we got out of the sticky air again. When we finally arrived at the Metro Station we took the Metro towards the University. A place my friend Anastasia was really eager to show me but didnt wanted to tell me why. And so we got out of the Metro Station and I was kind of surprised that we seemed to stand in the middle of a wood or at least a big Park. I had expected something else. To my horror my friend told me that we now had to go uphill, after all the Kilometres we had already walked that day. But thankfully the climb was not as bad as it first looked. And as we passed the time with laughing and joking we were on the top quite fast. Even though I am still a bit sad that my friend didnt wanted to allow me to play on the Playground we saw the signs for on the way up. As we arrived at the peak of the Hill we climbed I finally understood why my friend wanted to show this place to me. From this hill you had an amazing view on the whole of Moscow in the valley below us. What an amazing view. For the first time I could grasp how huge and vast this city really is. I couldnt see the end of it. It was spreading in all directions with no end. We had a good view on the Olympic Stadium and on the Skyscrapers in the background. A wonderful view. And a very popular view. There were a lot of people standing beside us on this lookout point. Including a whole Wedding Party. This was another place we could have stayed at for hours, but as our time was running a bit low we decided to get back into the city and took the Metro back. My friend showed me one of the very beautiful Metro Stations in Moscow that was decorated with a lot of wonderful statues. My friend told me that it is supposed to bring luck when you rub the nose of one Statue before an exam. I dont have an upcoming exam but I rubbed it anyway. You never know when you can need it. So now we were back in the city centre and started to get a bit hungry. So we started looking for a nice place to eat and ended up in an American Bar and Grill really close to the Red Square. So this time nothing typical Russian. But they had some really good Burger and I was very hungry after walking so much this day. But even then I didnt manage to finish the Double Cheese Burger, I might have gone for the regular one instead. But at least I had a really good Russian Beer. But I am still regretting that I haven't tried the Irish Cream Milkshake. That really looked amazing. Afterwards this really good meal we had a look into the big Shopping Mall right at the Red Square. What a splendour and luxury. For sure one of the most splendid one I have ever seen. Every top name Brand had an shop there and the whole mall looked very pompous with all its golden and glassed decorations. After that we stepped out into the Red Square again. And it was nice to see it now at a different part of the day when most of the Tourist were gone and the Square was bathed in a different light. It looked now even more peaceful and calm. A wonderful place to relax. Very enjoyable. Afterwards my friend needed to do some shopping and I decided to wait on the Market Square we had visited when we first arrived there. I stayed there till here return really content with watching the people pass me by. It is kind of funny when you watch people passing you by while talking and you are not able to figure out what they are talking about. But it was also nice for a change as this way your other senses like the eyes and noses were more in focus. And of course as I was sitting on a market square I had a lot of interesting and new smells coming my way. But all was very pleasant. As we still had some time till our train would be leaving we decided to walk a bit more, as if we havent already walked enough that day. Anastasia knew of a really nice lake with swans that was kind of half way to our train station, so we thought we might go there on the way. And so we headed out again into the Centre of Moscow. And the longer you walked here, you could see the differences to St. Petersburg. St. Petersburg is a very European City, as it was build after the Role Model of Amsterdam and a lot of Italian, French and German Architects developed the buildings and streets there. 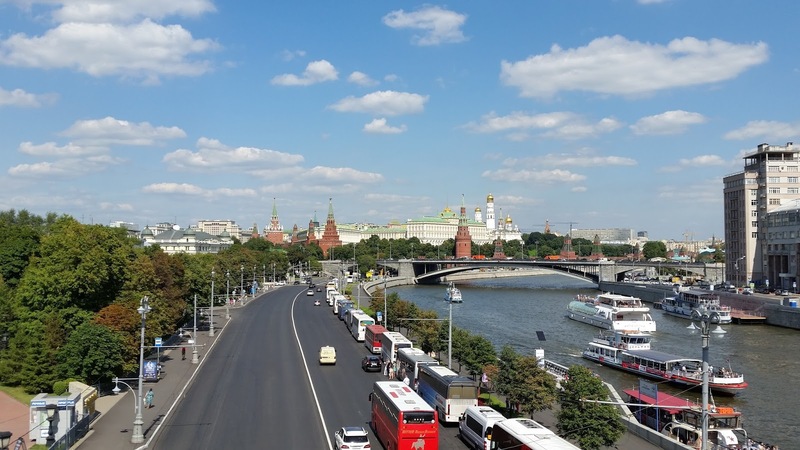 Where Moscow is typical Russian. The buildings had a different size and look. It looked not as pompous as St. Petersburg. Everything looked a bit more practical. But nonetheless very beautiful and inviting. And I also could remember friends telling me that it was way too dangerous to walk around in Moscow. The chances of getting robbed would be very high. Even in the centre. Which makes me wonder if we were talking about the same city. As I found Moscow perfectly safe. At least the parts we walked in. No difference to any other European city. Of course like every other city there will be districts you should avoid, but I didn't had the feeling that Moscow was particularly unsafe. But maybe we were just lucky. Who knows. So a bit later we arrived unharmed and safe at the aforementioned lake. And what a nice sight it was by night. Of course there were no swans to be seen anymore but a lot of people who used this warm and beautiful evening to sit down at the shore and to enjoy the warm temperature. It is nice when you can find such beautiful spots to escape in such a huge city like Moscow. After this short stop we finally made our way to the Train Station which seemed to be never ending. Both of us were really exhausted by now and happy when we finally arrived at the train station. We took a last cold drink in a nearby Pub before we walked into the station and waited for our train to arrive. When it finally arrived we both were lucky to get one and looked for our compartment. As I was too tired to figure anything other out then finding my way into the compartment I had some problems finding out which one was my bed. As my friend had still some more energy she showed me my spot to sleep and was even helping me to get my bed ready, which means in the time it took me to unfold the cover of my pillow she already had my complete bed made... I was so tired. But so good to have such great friends with you. It didnt took to long and I was fast asleep. So many impressions and thoughts on my mind after this amazing day. I woke up a bit disorientated the next morning and it took me a moment to figure out where I was. And then I remembered we were on board of the train towards St. Petersburg. And I think it must have been the slowest moving train in the world, as it seems to take ages until we finally arrived in St. Petersburg. Here and there our train had to stop for about 15, 20 Minutes and let other, faster trains pass by. But when we were actually driving it was nice to watch the landscapes pass by. We passed a lot of Forest and lakes that looked very mystical with some morning mist above it. We also passed some small villages that seemed to be totally isolated from the rest of the world. It really felt like travelling through a different world. 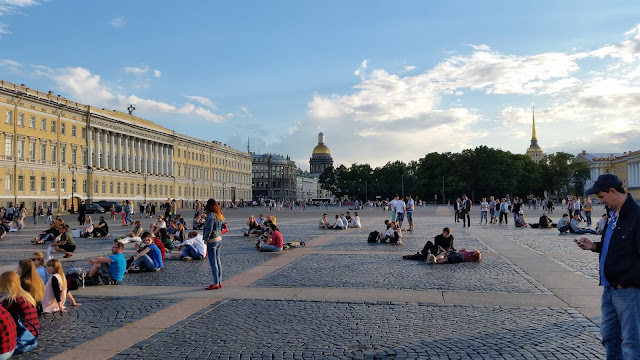 So it was kind of a strange feeling when we actually arrived in St. Petersburg and again were in this really lively city. What a contrast to the Train Ride. Anastasia who was as tired as I felt this morning decided to take the rest of the day off to relax a bit. Which would have sounded also good to me, but as I had so little time in this city I decided to forget about my tiredness for the moment and go out anyway and make the best out of this day. For the first time the weather was not good this day. It was a bit colder and it was raining here and there. So it was the perfect weather to go to a Museum. I had two I really wanted to see here. 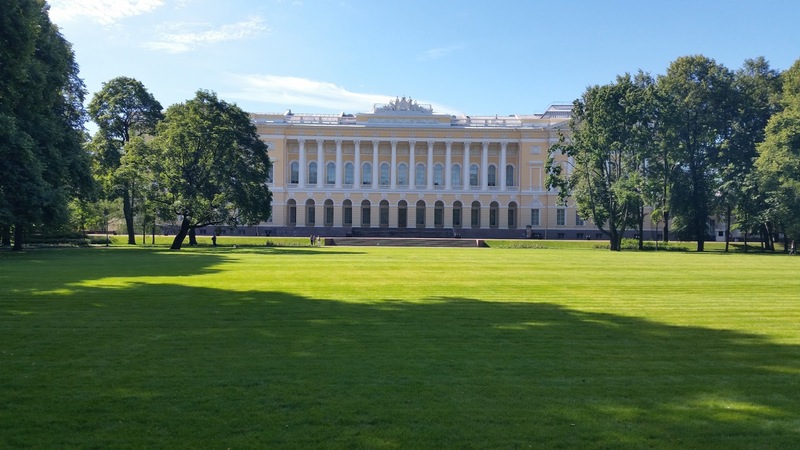 The Hermitage and the Russian Museum. As it was already too late to go to the Hermitage as you really need a lot of time there to have the chance to see at least part of the collection I decided to go to the Russian Museum today. Where the Hermitage has an amazing collection of International Art, the Russian Museum is focusing totally on Russian Art. 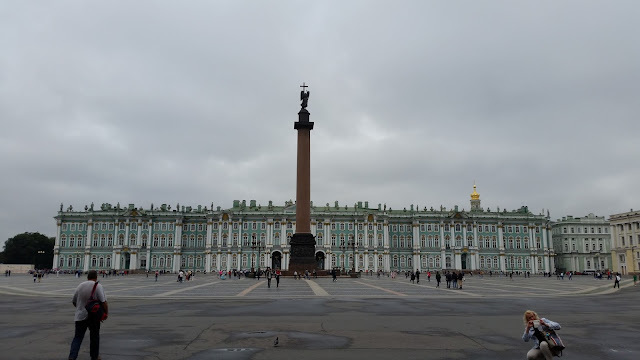 Located in different buildings around the city centre, but which you are allowed to visit with the same ticket within three days, the Russian Museum really got an impressing and beautiful collection. My first stop was at the Saint Michael's Castle. Built in 1800 as an Palace for Emperor Paul I, which is surrounded by Gardens, Rivers and Canals on all side. It is a very interesting building as it was build to look totally different from each side. And till today it is a really impressing building. On the inside you can have a look at the first part of the Collection of the Russian Museum. This part is housing a lot of wonderful portraits of the Russian Royalties and a wonderful collection of Paintings from St. Petersburg in the times of the different tsars.. Which makes it easier to imagine how life back then must have been and it gives you a good look into the interesting history of this city. From this Palace I went to the Main Building of the Russian Museum which is located only a few blocks away right next to the more then wonderful Michael's Garden. Which seems to be a very popular spot for relaxing when the weather is fine. At this day the Garden were emptier then in the days before, and as the rain stopped for the moment it was nice to stroll around a bit before I finally went to the nearby Museum, which is placed in an even bigger and grander House here. In the first moment you enter it can get really confusing as the Building is very huge and the corridors seemed to spread in every direction. So it was hard to find a starting point and I jumped right in and made tour around the contemporary and Modern Art. A very interesting collection with some very touching artwork. After that I walked through several different Gallery rooms that consisted of more classical Paintings and again a huge collection of Portraits. But not just the paintings itself were worth the visit. Also the Building is very nice and offers a lot of nice decorated rooms which really reminds you of a Palace here and there. The nice thing is that even when the Museum is big, it is not too big to see the collection in half a day without stressing yourself. So it was a really pleasant Afternoon I have spent there which gave me a really good impression into the the Art History of Russia. Even though to my shame I had to confess that I never heard from most of the Artists which Paintings were shown here. After the Museum I went to the Nevsky Prospekt to visit a Book Shop that Anastasia recommend me as wanted to look for some Souvenirs there. And no matter where I am, I really love going to Book stores. Of course I had the problem here that I couldnt read 99% of the books there, but it was still really nice to stroll through the aisles and look what they had on stock. And they had a really nice department with English and German Books. And I managed to buy some books from Russian Authors that got translated into English. And if I had been able to read in Cyrillic I would have stayed there for some hours more. And the opening times were a dream for someone like me. The bookstore stays open until 1 o'clock in the Morning. Something impossible in Germany. As it was already a long day for me with the short night in the Train and amount of walking I had done that day I decided the last thing I would do today would be to find a place to eat and then go back to the Hotel and finally get some rest. And so I walked down the Nevsky Prospekt in search for a Restaurant. And I remembered one recommendation of a good Italian Restaurant from my friend. And that is were I ended up in the end and had one of the best Pizzas I had in a very long time. Kind of atypical it was made with Potatoes and Beef. But it really tasted so good. Especially as the dough was wonderful made. Not too thin and not too big. Just perfect. I poured it down with a really good Russian beer and made my way back to the Hotel. Very tired but also very happy. Today I had the chance to sleep at least a bit longer. I was in bed very early the night before, as the day in Moscow and the last day were really exhausting for me. And it was nice to get some rest. And I had a very good night sleep, which was exactly what I needed. As today I had another Highlight planned. I wanted to visit the Hermitage. 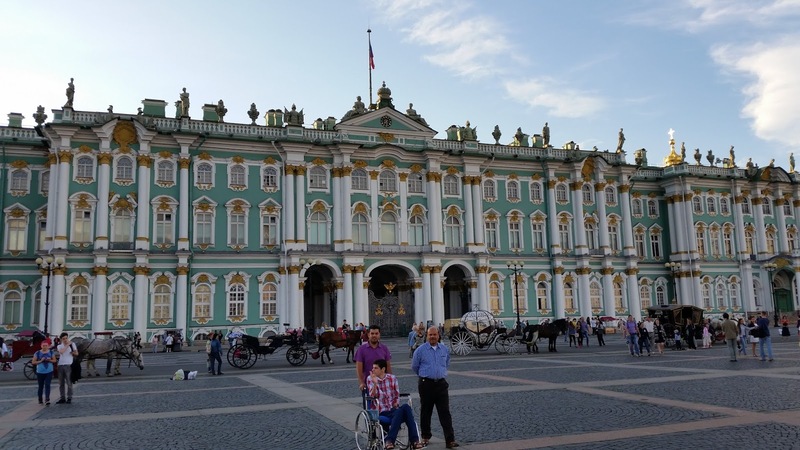 The Hermitage is one of the Museums in the World that you should have seen in the world. There are maybe just a handful of Museums that might have an similar impressing collection. Maybe the British Museum, the Louvre, the Moma in New York City and the Uffizi Museum in Florence are some of the few Museums which can compete with it. Think of one famous Artist and the chances are good that at least one of his Works will be in the collection. And thus the idea of the Hermitage was born, but as the collection got bigger and bigger, the Winter Palace was soon too small to house all this masterpieces. And so the Winter Palace was extended into several buildings until it reached today's form. And what an impressing Building it is. Taking in the whole far side of the Palace Square it looks very intimidating, but also in the same moment just beautiful with its artful and colourful ornaments all around. And so I made my way towards the palace this morning this time looking for an alternative way as I didnt wanted to make the detour over the Nevsky Prospekt, and I found a way that was leading me directly towards the Palace and gave me the chance to pass the famous Statue of Pushkin not too far from the Palace. A really nice Monument for an great Poet. A few minutes later I was on the Palace Square and found my place in the queue. Anastasia already warned me that the queue will be very long as day by day several thousands of tourists are visiting the Hermitage. I was there early enough so that the queue was not too long. But still then it took a long time until I was finally inside of the building. First only the Main Gate to the Palace was opened so that we were able to wait in the Courtyard instead of waiting outside. Beside a small Park in the centre of the Courtyard, it is not as nice you thought it would be, as it is mostly made out of concrete and everything seemed to be made in grey. But of course the walls of the buildings are as colourful as on the outside. Step by step the queue was getting closer to the entrance and then finally the waiting time was over and I was inside of the building. I bought my ticket and left my backpack at the Baggage Drop and finally went in. I decided to get an Audio Guide which was a good decision as it was nice to learn a bit more about some of the Artworks on the inside. And what a first impression you get of this building. As you are entering the Museum which starts upstairs via the marvellous Jordan Staircase. A staircase that really looks as out of an fairy tale. Unbelievable. Over an laid out Red Carpet you are walking upstairs on a Staircase that is just breathtaking. Everything around you seemed to be made out of Marble and Gold. The walls are decorated with several Statues and Ornaments, on the ceiling you can see a very impressing painting that takes in the whole ceiling. But the staircase alone is a Masterpiece. I tried to imagine when you were summoned to one of the Tsars back in the time and the first thing you saw inside this palace was this amazing Staircase. I am sure you must have felt very small and insignificant. Which surely was what the Emperors wanted to accomplish with this Piece of Art. I was surely in awe for several minutes and wasn't able to move as I was more then impressed with this powerful monument in front of me. And haven't it been for the several hundreds of visitors who were trying to get up the stairs or were posing for pictures there I would have stayed there for a longer time. But now I tried to make my way through the huge Collection of the Hermitage. I had the same problem as in the Russian Museum, the Winter Palaces are huge and at every corner was a new corridor leaving towards a different part of the Collection. As I had no clue which was the best way to start I just turned around one corner and followed my nose and ended up in an amazing room that in the past surely must have been an official Reception room as it was very ostentatious. Several Chandeliers were hanging from the roof, the floor was made out of marble and the whole room was decorated with artful Mosaics, Statues and Ornaments. In the centre of the room was one of the Highlights of the Hermitage Collection. The famous Peacock clock. 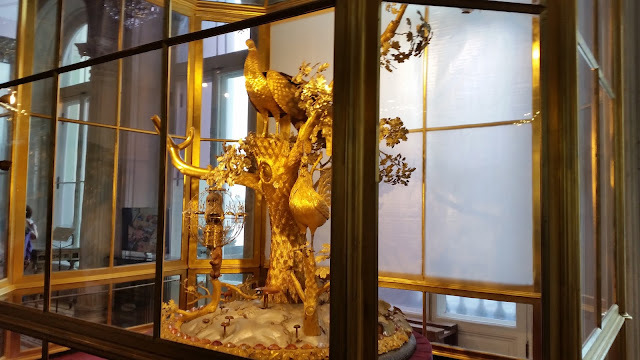 An amazing huge clock made out of Bronze, silver and golden Materials with a huge Peacock in it's centre besides a smaller rooster which are both sitting on some kind of trees. Once a full hour was struck the rooster would craw and the peacock would move its feathers and up till today the clock is still working. But it is only used for special occasions. Once it belonged to General Potemkin who got it as an present from Catherine the Great. What an amazing sight. I was here just for a few minutes and was already more then amazed. And it stayed this way as I made my way through the collection. It is hard to mention every Artwork I have seen that day. For that it was just too much, but I made my way through a very impressing collection of Italian Paintings that includes works by Leonardo Da Vinci, Rafael and Tizian. 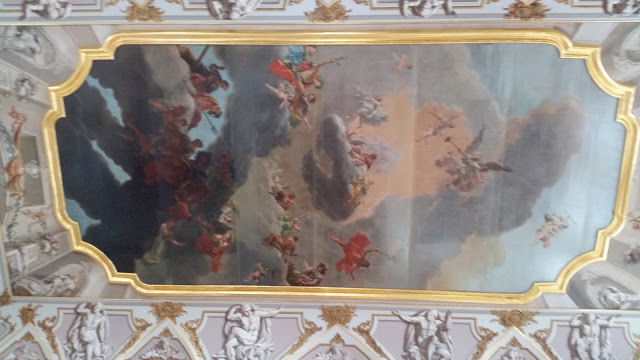 Thanks to the Audioguide I learned a bit more about the background of the paintings. Right after the Italian Paintings I stumbled into a marvellous collection of Dutch and Flemish Paintings with Masterpieces from Rubens and Rembrandt at its centre. And so it went on, there were Galleries with the focus on French Art, British Art and Russian Art. Not to speak about the very interesting Egyptian Collection that also includes a Mummy. And also a really impressing collection of Roman and Etruscan Antiques. And I just managed to get through half the collection in the more then five Hours I have spend there. But to be honest after these five hours I was just too tired to focus on even more artworks. And I didnt even managed to discover the paintings from Monet or Picasso. But I was already more then satisfied with my visit here. It was not just the collection that was so impressing but also the whole building. 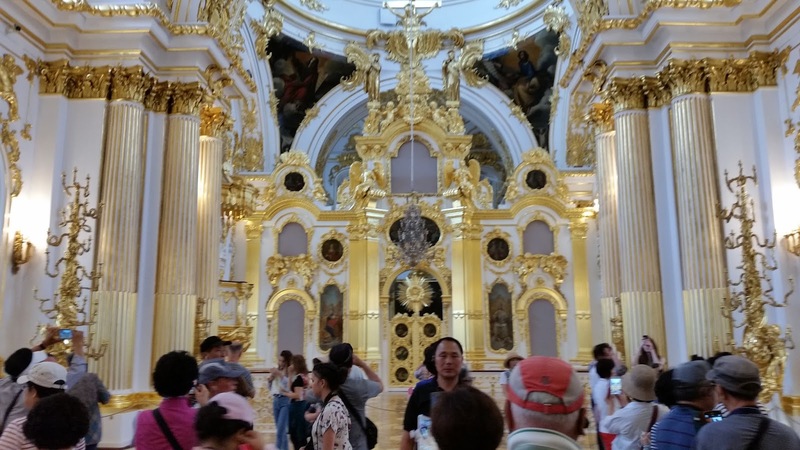 You were able to visit some of the private chambers of the Tsars which were a dream of Gold and Velvet, you walked through the Throne Room, which seemed to be big enough to organise a football match inside of it. And several other rooms that had an official function. What an luxurious life the Romanovs must have led. I rarely have seen so much richness in one building. Again I had the same impression I had on the Stairwell while entering who ever came here on an official mission must have been more then impressed and must have felt very humble. The downside to this great Museum is the number of Tourists you have here which is just too much. Beside the single visitors like me, who comes in very high numbers you have an even bigger number of Tourist Group that are led through the Museum in a hurry as it seemed. 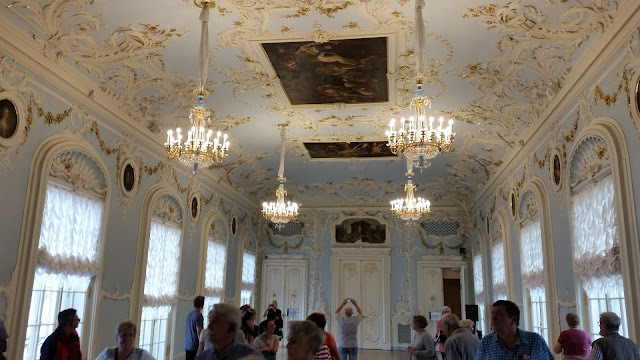 So at some points in the museum, like in some of the small Royal Rooms you cant barely move because too many tourists are trying to squeeze themselves through the small spaces at the same time. And of course seeing some of the paintings of popular Painters like Rembrandt can be hard as every tourist group will make a stop here and then you have at least 40-50 persons in front of you. Which is getting a bit annoying after some time. But still beside this, the Museum is something you have to see when you are here. Absolutely amazing and fantastic. But after five hours this was enough culture for one day, for the late afternoon I wanted to meet with Anastasia again who was waiting for me in the City Centre. On the way I stopped at the Bookstore again as I had seen an German Book I wanted to give her as an small gift to thank her for her hospitality. It was a book with Novellas from Stefan Zweig. A wonderful Austrian Writer. And as Anastasia is learning German I thought this might be a good exercise for her. I gave it to her a bit later when we were seated on the on Porch of a really nice Steak House not far from Nevsky Prospekt and was hoping that she might like the book and will read it one day. The dinner we had in this Restaurant was really good, I had a beef patty that was perfectly grilled, almost like a steak, with it I had some grilled Bell Peppers, some fried Potatoes with Onions and beside the Meat I had another big heap of Onions. I think that might have been the best dinner I had during my time in Russia. Just wonderful. After we had some coffee/Milkshake in a nearby coffee shop, while watching while some people were trying to throw coins up to the statue of a black cat on a house, which is supposed to be good luck. But it was harder then you might thought as a lot of people failed and tried again and again. We just watched and smiled with the people who tried to get some good luck. After that we called it a night and I went back to my Hotel as we wanted to meet up early again as we still had some places we wanted to go. So I fell asleep really tired that night, but also really happy as I have had an amazing day with a lot of new impressions. So no need to throw a coin up to the black cat that day. :) I already felt very lucky to be here in this amazing city. Hard to believe, but my vacation already was coming to an end. Only two days left in which I was able to visit some of the many sights here. One week is surely not enough time for this city. After a good and hearty breakfast I made my way towards Nevsky Prospekt where I met with Anastasia again. 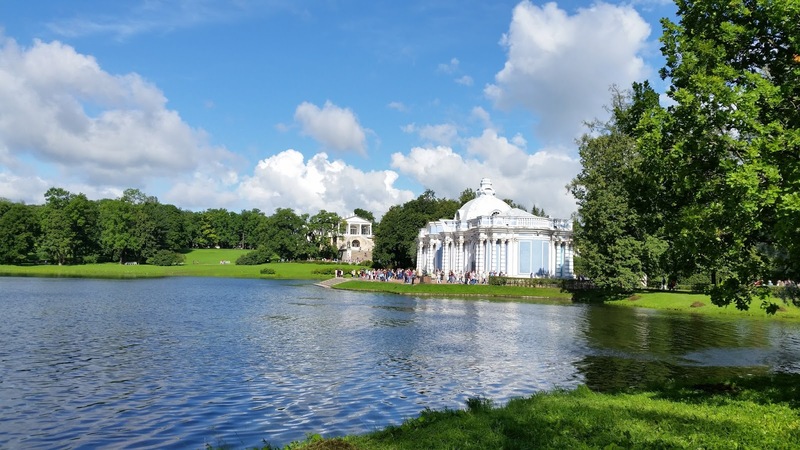 This Morning we wanted to go to Pushkin, a small town which is located some Kilometres outside of the city. To get there we had to first take the Metro and then take a Bus directly to Pushkin. The reason we were going there was that one of the biggest Highlights of this area was located there. Catherine's Palace. 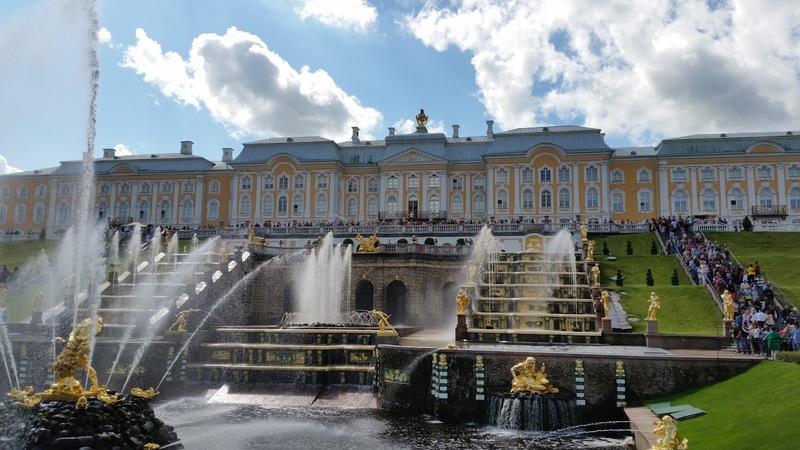 The original Palace was build for Catherine I, the wife of Peter the Great and the later Empress of Russia. However the Palace was later first changed and then torn down and rebuild in a different style by her Daughter Elizabeth. And that is the form you can still marvel at when you go there today. But before we got there we had to walk for some minutes through Pushkin, which made the impression of a very laid back and beautiful town. Anastasia told me that the houses here are very expensive and I can totally imagine that, as the town made a very wealthy impression. Beautiful houses, everything looked clean and looked after. A lot of green around you. I am sure it is a nice place to stay. We passed a really nice church on the way which made me marvel again how wonderful and beautiful the churches are build here. Such a good eye for the details both on the interior and exterior. 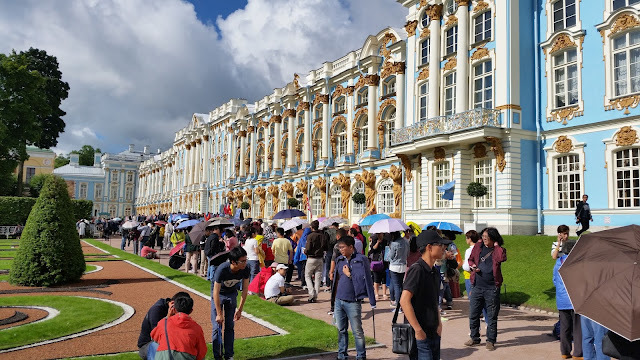 Anastasia told me that there was a reason why we were going first to this Palace and on the next day would be going to Peterhof, the Palace Peter the Great build for himself. Because if you have seen Peterhof first, this Palace wouldn't look as impressing as it might look if you see this first. Which is something that is hard to imagine when you see it for the first time. This Palace that is 325 Metres long and got a more then beautiful Rococo Façade on the outside in which more then 100 Kilograms of Gold were used for the decoration and statues during the building. It is an sight that will leave your mouth wide open when you see it. It was more then beautiful. 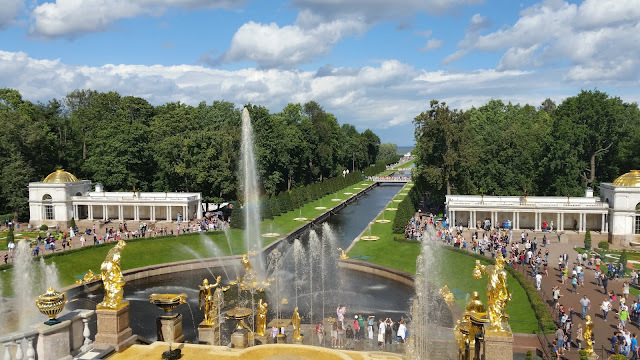 My first reaction was that no way that Peterhof can be even more impressing. This Palace, which façade seemed to be never ending, is truly an masterpiece. If I already thought that the Winter Palace was impressing, then you would have to find a new word for this one. Just amazing. The walls are filled up with so many details and ornaments that it is just hard to discover all of it or even try to describe it. It is just overwhelming. And add to that that on the inside you have between a lot of very pompous rooms the replica of the Amber Room. The original Amber room was built inside this Palace for over 200 years until it got destroyed during the second World War. Almost as overwhelming as the Palace was the amount of Visitors that morning we had been there. 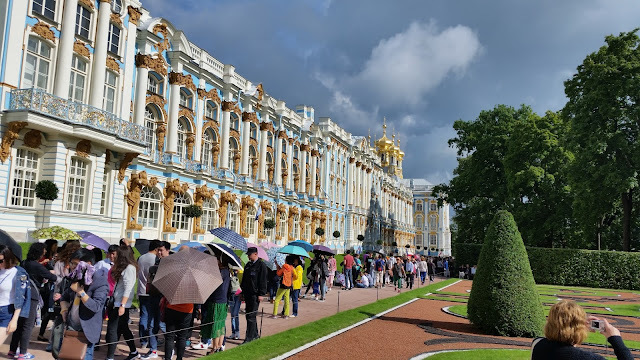 The Queue around the entrance to the Palace was very hug which is why we decided to have a walk in the wonderful Gardens of the Palace. But the word Garden doesn't really fit it, as it is a huge Park that is one of the most inviting I have ever seen. It is a mix between very wonderful tended parts and more wild looking forest areas. In the tended area you would find Grass Lawns that even in England could have been more tended. And the Guards working in the Garden were really strict in making sure that no one was stepping onto the lawns. Otherwise they would use their whistle and give you a warning to not try that again. Beside the lawns there were beautiful Flower beds that had flowers in every existing colour as it seems and the Roses were smelling just wonderful. There were also alleys with wonderful trimmed trees that also reminded you of the British Garden Culture. Just very inviting for walking around. In the middle of the park there is a huge lake that also marks the border from the well tended parts into the more "wildly" parts. The further away you get from the Palace the more trees and bushes you will find. Still here you find some wonderful buildings like a beautiful chapel and kind of an Stone Pyramid and a wonderful Bridge with a stone roof. But surely Nature is more dominating here. And it was here that my friend Anastasia found a new friend. A young squirrel that was eagerly looking around for something to eat. It was running up and down the trees always near to the tourists and it was really unbashful as it got closer and closer to us and even climbed upon Anastasia's foot to see if she had any food with her. Unfortunately she didn't and so the Squirrel jumped away a few moments later. My friend was so moved by the little squirrel that she tried to get some Nuts at some of the small booths where snacks were sold but unfortunately they didnt had anything suitable for a squirrel so we had to leave the squirrel unfed. The closer we got to the Palace again, the more people we met again, in the distant parts of the Park it was thankfully a bit quieter and not so crowded. But now as we reached the Palace again we had to see that the queue was now even longer and was going back right to the entrance to the park. As we both didnt really felt like waiting for an eternity to get in we decided to skip the palace and walk a bit more in the free areas of the Park that lay around the other side of the Palace. Of course these were not as tended or grand as the ones on the interior of the Property. But they still were really nice to walk through, some parts were decorated in a more Chinese style with Pagodas and some Statues. It made for a nice walk here. After that we decided to drive back towards the city as I wanted to visit one of the shopping malls to see if I can buy some things for home there. 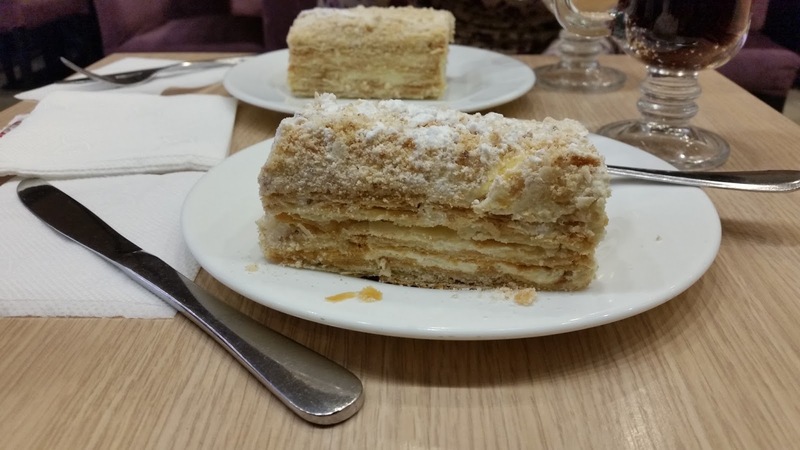 But even more important, I wanted to try the famous Napoleon Cake. That already was an good enough reason to drive back as soon as possible. And about an hour later we were back from the very calm Pushkin in the Midday madness of Nevsky Prospekt. What a difference. Thankfully it was not far to the Cafè my friend wanted to go with me, for as they had a really good Napoleon Cake there. And they surely had. The Cake original Recipe comes from French, but was alternated a bit to get a Russian Version of this Cake. Made up of several layers of Puff Pastry that are filled with pastry cream it surely is a delicious cake. A bit hard to eat as the Puff Pastry is crumbling like hell and so I was struggling not too look to bad after I had finished it. The taste was really great, sweet and creamy but not too sweet. It was interesting to learn that this Cake goes back to the Victory above Napoleon in 1812 and the triangle form of each slice shall resemble an Bicorne, the hat Napoleon always wore. Furthermore the several layers of the cake shall resemble La Grand Armee of France. And the crumble on top of the cake shall resemble the Russian snow under which the French Soldier had to suffer. So you even find political innuendos in cake. After this wonderful cake it was time to do some shopping. After some time in two post offices. The service in the first was too bad that we had to look for a different one to have a chance to get served at all. And funnily in the second Post Office was a Lady in front of us who, as my friend translated to me, was heavily complaining about the Post office we had been before. Such a small world. After that Intermezzo we made our way into the Shopping Mall, and how glad I was to have my friend with me as it was nearly impossible with the people in the shop. I wanted to buy some shoes and it was really hard to make yourself understandable in which size you would need the shoes and so on. So it was good to have a translator with me. And so I left the Sport shop really with a new pair of shoe and not with a Tennis Racket or an Baseball bat. We then also wanted to look for a CD Shop as I wanted to buy a CD of an Russian Artist Anastasia introduced me to. Viktor Tsoi and his band Kino. But unfortunately there was no CD shop in this mall. So bad luck for me. As Anastasia unfortunately had to finish some work that evening we decided to call it a day and decided to meet again on the next Morning to do our last Day trip on my last day in St. Petersburg. But as it still was too early to stay in the Hotel I followed an recommendation of Anastasia to visit a Church that in her opinion was worth a visit. As it was in a different part of town and quite a distance from my Hotel I decided to make a long evening stroll out of it. And it was a good chance to wear in my new shoes. But on my way towards the church I made a stop at my favourite Italian Restaurant in this city and had that amazing Pizza again. But after the Pizza and the Cake I had before, I now really needed that long Walk to burn these calories again. The church I was walking to that evening was the St. Nicholas Naval Cathedral. A very beautiful Orthodox church build up in the Baroque style. As St. Nicholas is the Saint Patron of the Sailors no wonder that this church is not too far away from the Harbour. And it surely is a very beautiful church with its blue coloured Façade and its golden Onion Domes on top of it. I arrived there around the time dusk was setting in and so the Gates where about to be closed but at least I got a good look and made some nice pictures. But not only the church was a good reason to make this walk that evening, but also the whole way was really nice. Most of the times I was following one of the Main Canals that was leading me directly to the Church from the Nevsky Prospekt on and was leading me past some wonderful bridges and beautiful old buildings, through some very lively neighbourhoods. 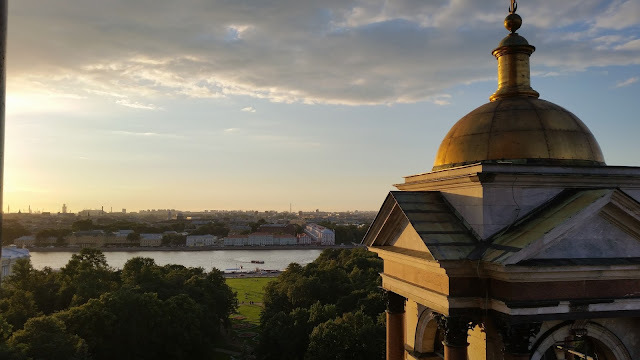 And on the way back I followed a different Canal back towards theNevsky Prospekt and got some wonderful views on different palaces and the amazing Isaac's Cathedral. And especially now in the beautiful evening mood. 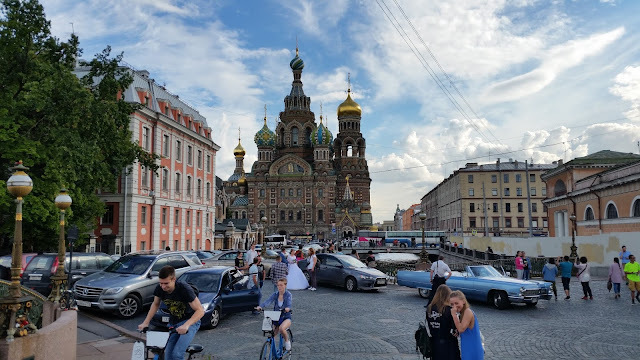 I passed the Nevsky Prospekt as I wanted a more quieter way home to the Hotel and followed some smaller streets and Alleys until I reached the Church of the Saviour on Blood again. And what a nice sight now that the light was gone. A very peaceful sight. But still at this time there were more then enough tourist who wanted to get inside the church. I thought about queuing in, but I felt too tired after that long day and I was still very impressed by the sight of the Palace this morning. And of course of the Cake! So I decided to walk back to the Hotel and my feet were really thankfully when I finally reached it and was able to lay down. Another wonderful day in Russia and I fell asleep very content that night. On the next morning I again met up with Anastasia on the Nevsky Prospekt, from where we took the Bus towards the Harbour. 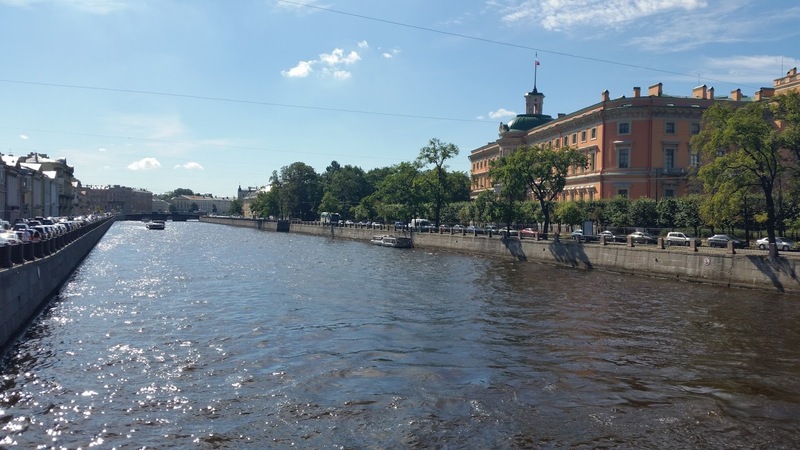 As our today's destination was going to be Peterhof and we wanted to take the boat there. While we were still in the Bus Anastasia had a big surprise for me and handed me an Best of CD from Kino, the CD I was looking for. After she left the office really night before she made her way to an CD Store her colleague told her about. I was really speechless. It is so nice to have good friends!!! As we arrived at the Harbour and went down to the ticket booth to get the Tickets for the Peterhof Express, a faster boat that is taking visitors directly from the city centre to the Palace. But we had to wait for about an hour as the next ship was already full. So we walked around a bit close to the waterside and enjoyed this warm and sunny morning. On time we came back to the Pier and entered the boat. And after everyone got on board we were immediately on our way. 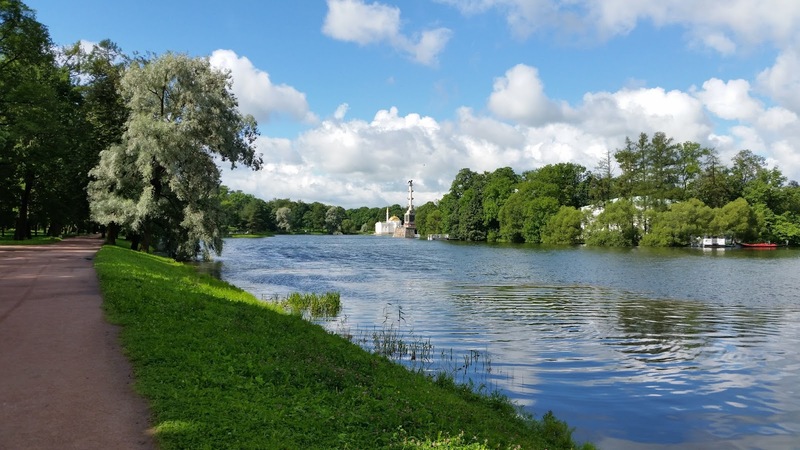 It was interesting to see that there were no security advices as there usually are when you are taking a boat ride, but thankfully they were not necessary as we arrived safely in Peterhof. 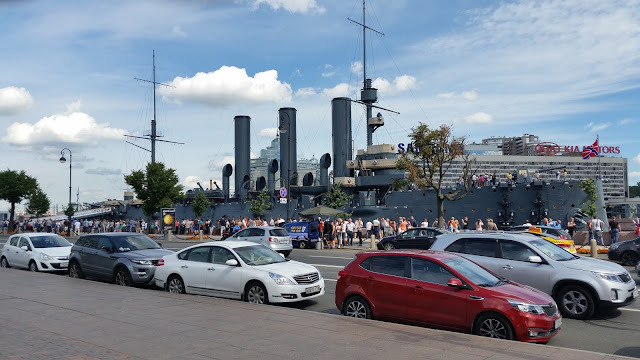 The ride itself was really nice as we first drove along the Neva and passing the whole city on our way before we entered the Gulf of Finland and there only seemed to be water around us, even though we were not really that far away from the shore. After 45 Minutes we arrived directly at the Pier below the Palace and we were in walking distance to the Entrance. Really convenient. In some popular tourist spots in Russia you have to expect to pay more as an foreigner as an Russian Citizen. Which I already knew from Costa Rica, where often the prices for tourists were double the price as for Costa Ricans. And surely it is understandable as they trying to earn enough money to be able to maintain the buildings and parks. Here I was lucky that I had an Russian Native with me who bought the tickets for us, as you needed to show your passport when buying the tickets. When she came back she ordered me to stay silent until we have passed the entrance as she bought an "Russian Ticket" for me. I did my best to shout my mouth for some minutes but kind of awaited that something would went wrong and I surely would get asked an question in Russian from the persons at the entrance and then would maybe have to swim back to St. Petersburg. But everything went smooth and I was able to enter without a problem. And did I said before that I was sure that Peterhof couldn't impress me more then Catherine's Palace? Well forget that. Anastasia was absolutely right. Even from afar, as we still were some hundred Meters away the Place looked Mind-blowing. We were walking along a path towards the Palace, that was following a small canal that was leading towards the Palace. Here and there were some marvellous Fountains that were all created back in Peter the Greats time and are working only through Gravity. Here and there the canal was embellished by beautiful ornaments through which very often the Water was pumped into the canal. And it was amazing to see how much focus the Architect put on all the small details here. But of course the real centre of attention was the Amazing Palace. Especially with the Grand Fountain, that alone is already worth the entrance fee, in the foreground is an image that you will never forget. Even though the Grand Palace here is smaller then Catherine's Palace but still bigger then Versailles, it makes a much bigger impression on the visitor. Maybe it is because you are seeing it first from a lower point and you first have to climb up a hill to be on the same level, so it gives you the impression of being much grander then it actually is. But the building itself is just an Masterpiece of Architecture. As it was already done at the Catherine's Palace, the façade was richly decorated with wonderful ornaments that gave the Palace a unique design. Surprisingly not so much gold was used here. It was more used in the Fountains all around the Palace. But it was not necessary to make the Palace look impressing. With his orange coloured façade and the white roofs it just looks very remarkable. And it is cornered on both sides by very impressing Buildings that are more in the before mentioned golden Style with a richly decorated exterior and an amazing Golden Dome on top. And in total with the wonderful and huge Fountain in the foreground is an sight that will leave you standing with your mouth open. Which Grandeur. Alone the Fountains, both the Grand Fountain and the Samson Fountain would be more then impressing enough, with its several golden steps that are leading down towards the Main pool at the bottom that is decorated with a rich variety of beautiful carved statues And everything made in Gold. I was really speechless. So marvellous. Unfortunately the other thousands of people thought the same way, so the place was even more crowded then the Palace on the day before. But still, it was fantastic to be here. And like on the day before we decided to walk around the Park. It is even bigger then the Park we visited the day before and also styled in a different way. Was the first park a very open space with some wild corners, so was the Park here a bit more closed and more perfectly styled. 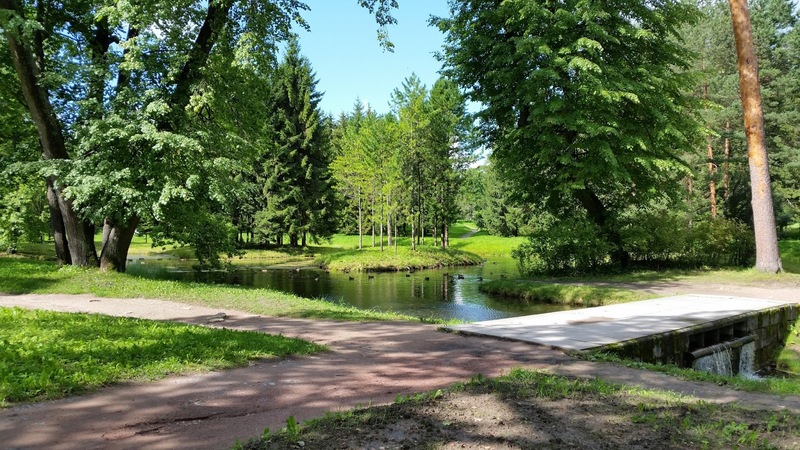 Instead of wide open spaces here you found alleys where trees were planted in the exact same intervals and the Park Guardians here were even stricter to make sure that you don't step on the lawn. Unlike on the day before we were better prepared this time as I bought some Nuts the evening before. And so we were to meet any Squirrel today this time we would be able to feed it. Even though the Park was maybe a bit too styled, it still was a really nice and relaxing place. The further we got away from the Grand Palace the less people we met. And this was nice as it was now getting a bit quieter while we walked along the different alleys. Here and there you found some statues and more fountains. It was like walking in a Fairytale Land. And it didn't took long until we found our first Squirrel that day. Although it also was not shy, but it didn't dare to come as close to the humans as the one the day before. But still Anastasia held out her open Hand with a nut in it, and the Squirrel almost touched the hand with his snout before it moved away again. Anastasia then dropped the nuts on the ground and the Squirrel took it as fast as it dared to do so. Such a cute sight. We some another Squirrel but it was too fast for us and when we arrived at the tree we have seen it in, it was already gone or really well hidden. But Anastasia left some nuts for it on the ground anyway. We hoped that it would find it later. We continued walking through the Park for some hours more and it seemed to be never ending. And in every corner you find something to marvel at. 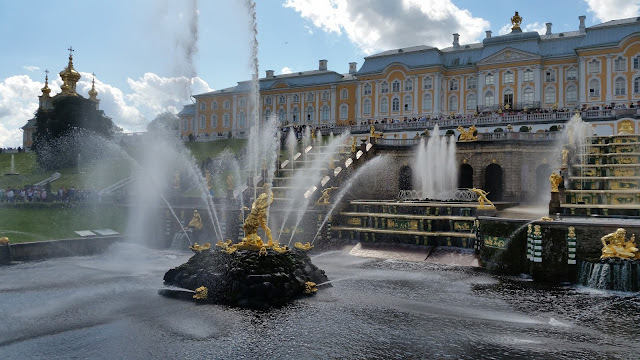 Some more or less big Mansions, wonderful statues, some more impressing Fountains, which seemed to be something Peter the Great must have very enjoyed. They often were build in a very grand scale so that the water was cascading down several steps into a Main pool where also an Main Fountain was installed. There was also a very beautiful lake in the Park that looked very inviting to sit down at its shore to rest a bit. Here and there you had some nice views on the Gulf in the Background. It was just wonderful. Beside the Grand Palaces there are also some smaller Palaces here and there. One of the most famous is the Monplasir Palace. which was one of the first Palaces Peter had built here. Like the Grand Palace and a lot of the other parts it got badly damaged during the Second World War but got rebuild in the way it had originally looked. Even though it looks quite small beside the Grand Palace it still is an wonderful building. Right next to it in the Lower Gardens are some fountains that are build in the way that they are activated when someone is approaching it. And it surely was very popular with the kids who were walking in an out of it screaming and giggling at the same time. And on a hot day it surely is a good way to cool down. We then made our way up towards the Hill the Palace was standing on and approached it now from its left side. And it was amazing to see it now from so close and also wonderful to see the Grand Fountain and the Samson Fountain now from above. Truly an Masterpiece. And I felt more then happy that I had the chance to visit this wonderful place. As we wanted to get inside of the palace we had the same problem as on the day before. The queues were too long and on top of that there are times when you can only enter the Palace as part of an Tourist Group. And such a time was approaching now. So as on the day before we decided to skip the Palace as it is not so much fun to walk inside of it with several hundreds of other persons at the same time. Instead we visited the Part of the Park on the other side of the Palace where we got an good view on the opposite side of the Palace before we made our way towards the Bus Station where we took a bus back to St. Petersburg. We had to get out a bit before the city centre to get the Metro back into town. As I learned we were now at the first build Metro Station that was just your usual and typical Metro Station with Chandeliers under the ceiling and with a lot of Marble used in the making of the floor and walls. Very amazing. Back in the centre we walked around a bit as Anastasia still wanted to show me a beautiful Park. The Summer Garden that are located right next to the Mars Field where we have already been on the first evening. On the way to it we stopped at a Restaurant to get a late lunch / early dinner at an Crossover Cuisine Restaurant that offered a mix between German and Russian Cuisine. And they really had some interesting dishes that mostly consisted of some Meat with Cabbage or some other vegetables that are used in both cuisines. I had a "Schnitzel" with fried cabbage and an fried egg of it. It tasted surprisingly very good. Funny that now as we were sitting under the Roofed terrace of the Restaurant it started to rain, the only time on this otherwise perfect summer day. And at the moment we left the Restaurant it was sunny again. So it was perfect timing. We then walked on towards the Summer Garden and crossed the Mars Field, to find out that the Summer Gardens were closed. Not sure if only for the day or for a longer time, but it looked as if there was some Maintenance going on. So we decided to walk a bit more and then took the bus back to the Nevsky Prospekt. And now as we got out the saddest moment of the whole week was coming as I had to say farewell to my friend Anastasia. I think we both were a bit moved this moment as it was really strange to say Goodbye after we have spend so much time together in that week and visited so many amazing places in that time, and so we hugged each other and a bit sad I made my way back towards the Hotel as I still had to pack the rest of my stuff and get ready for my early departure the next morning. And so after the farewell I went to bed with an kind of bitter-sweet feeling as I was both feeling happy and sad. Way too early again I had to get up this morning as my cab was picking me up at five in the Morning. And as it arrived on time I was on my way to the Airport and had some time to think about the past week I had here in this city while the city was passing me by behind the window. It was already surprisingly bright for such an early time which gave me the feeling that my watch was not working properly. I thought about how my expectations of this city and the country had been and how it was in Reality then. And I have to say I was surprised in a very positive way. I had an totally wrong image of Russia in my mind before I arrived here. And for sure I have only seen two cities of this vast country and I can imagine that the country side would be different. I guess there you might see the financial problems of this country on a bigger scale. 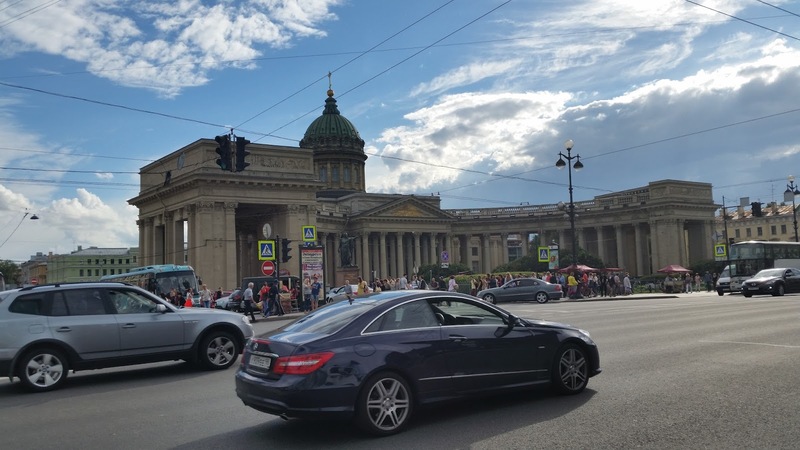 Both St. Petersburg and Moscow made the impression on me of being very lively and modern cities. Both were very inviting and welcoming. And the History and Culture that I got offered in both city was more then amazing and impressing and more then I had dared to hope. I have seen so many wonderful and interesting places that had an important meaning in the history of this country. I have seen so many impressing Palaces and Churches that it was unbelievable that such grandeur can really exist. And also the landscapes I have seen on my way between the cities was really beautiful. And I surely can imagine coming back to this wonderful country as I really had an amazing time. For the first time I like to dedicate my Blog to a person. And I would like to dedicate it to my dear friend Anastasia.